Does Visa Pass Warren Buffett's Test? How does the payment processing giant stack up against Buffett's acquisition criteria? With thousands of stocks available for purchase, it can be hard to separate winning investment ideas from losers. That's why it makes sense to develop a checklist that can help you quickly vet potential candidates. This is a tactic Warren Buffett uses when he makes multibillion-dollar acquisitions at Berkshire Hathaway's (NYSE:BRK-A) (NYSE:BRK-B). There's no need to reinvent the wheel when you are creating your checklist, either. In fact, simply copying Buffett's list of criteria can be a smart move. While individual investors can't know what offering price Buffett may receive in exchange for swallowing a company whole, we can use his first five items to see if a stock could be a good investment. Knowing that, let's run the payroll processing giant Visa (NYSE:V) through his checklist to see how it holds up. With tens of billions of dollars to invest, Buffett set up this first criterion to ensure that only large, stable, and profitable companies find their way in front of him. Thankfully, Visa sails through this first test with ease. The company rang up more than $15 billion in total sales last year, and impressively, Visa converted more than $8 billion of that total into pre-tax profit. Buffett wants to own businesses that can remain highly profitable even during periods of market stress. That's why he demands that all potential investments candidates prove their profits can remain high for long periods of time. 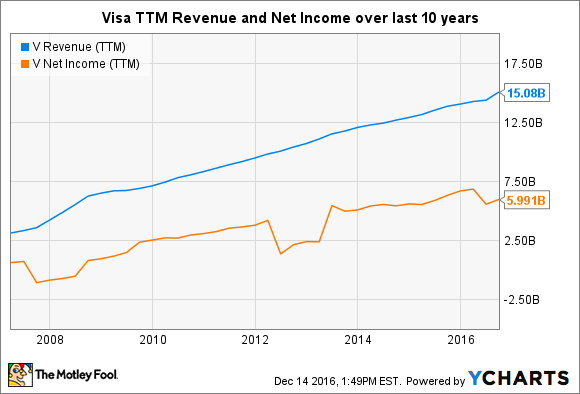 Here's a look at Visa's revenue and net income over the last decade. V Revenue (TTM) data by YCharts. As you can see, the company's revenue and profits have both consistently headed higher over time. That makes sense as consumers continue to ditch cash and checks in favor of credit and debit cards when making purchasing decisions. I think Buffett would give Visa a passing grade here. Buffett believes the best companies are capable of generating high returns on equity without the need to juice the numbers by carrying a lot of debt. V Return on Equity (TTM) data by YCharts. 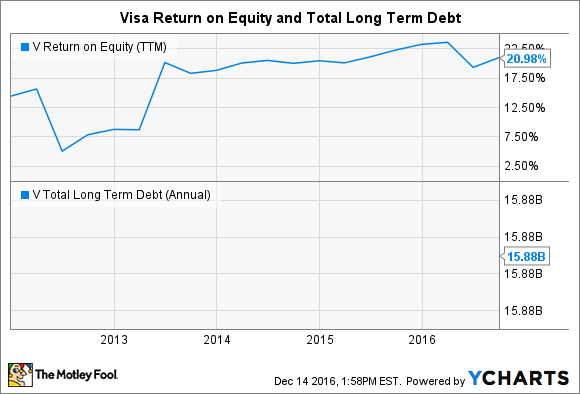 Visa has generally kept its return on equity quite high even though its business was largely debt-free over the past five years. However, it's worth noting that Visa recently decided to take on more than $15 billion in debt earlier this year to help fund the buyout of Visa Europe. That's a big number, but since Visa can easily afford the payments and has a proven track record of operating without debt for years on end, my hunch is that Buffett would be willing to give the company a pass. Visa just recently went through a big management change in the corner office. The company's former CEO, Charlie Scharf, decided to step down since he could no longer spend enough time in San Francisco to lead the company effectively. In response, the board gave the top chair to Alfred Kelly, Jr.
Kelly seems like a great choice to lead Visa moving forward. He has been on Visa's board since 2014, and he spent more than 23 years at American Express, including a period where served as the company's president. Right behind CEO Kelly is Ryan McInerney, who has served as the company's president since 2013. McInerney is another industry veteran that spent a large portion of his career working as the CEO of Consumer Banking for JPMorgan Chase. With these two industry veterans calling the shots, I think Buffett would give the company a thumbs up here. While Visa's business model isn't quite as easy to understand as a candy maker or home builder, it isn't too difficult to understand how this company makes money. At its core, Visa acts as a middleman between consumers, financial institutions, and merchants. The company operates the largest electronic payments network in the world, called VisaNet, which provides authorization, clearing, and settlement services for its customers. Visa earns a small fee each time a transaction occurs on its network, essentially operating as a digital payment toll booth. The scale of Visa's operations is truly breathtaking -- over the last 12 months, Visa connected 16,800 financial institutions, 44 million merchants, and more than 3 billion credit or debit cards. In total, the company processed more than $8.2 trillion of payments. Better still, these numbers continue to grow with each passing year as consumers and business alike shift to digital payments for their speed, convenience, and security benefits. We know Buffett is very comfortable with buying financial stocks since Berkshire holds sizable positions in companies like Wells Fargo, American Express, and U.S. Bancorp. I'm willing to bet he would be quite comfortable with Visa's business model, too. Is Visa on Buffett's buy list? Add it all up, and Visa scores a five out of five on Buffett's checklist. Given that stellar score, perhaps it shouldn't come as much of a surprise to learn that Berkshire is already an investor in Visa. In fact, Berkshire currently owns more than 10 million shares of the company's stock, which is worth more than $800 million at current prices. Of course, given that Berkshire's market cap currently exceeds $400 billion, the company's stake in Visa is still just chump change for the Oracle of Omaha. Still, since Buffett likes Visa enough to be a shareholder, perhaps you should consider becoming one as well.